If you have ever developed a web application in one language and then needed it for another, you will understand the frustration of not being able to intermingle when it comes to web app development. Two very common programming languages that are used in web development are Microsoft .Net framework and Java. Traditionally these languages run on different platforms and whilst you can get some basic communications to work between the two, you cant really get a smooth interoperability going between them. JavOnet have addressed this issue commonly faced by web developers and have come up with a proprietary solution that allows you to reference any DLL compiled in Microsoft .Net, within your Java based web application as well as server and desktop applications. 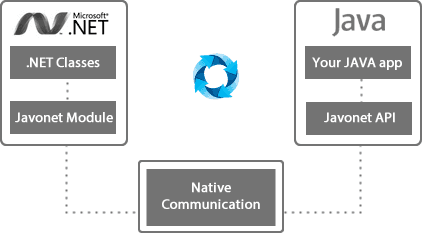 The way that JavOnet works is really cool – they have a relfection style API that sits between your .NET DLLs and your Java application and translates operations performed by the .NET application into your JAVA application using the API system. The above diagram shows how JAVA invokes through Javonet .NET method and Javonet translates the result back to JAVA. The JavOnet framework does the rest of the work for you, and your .NET DLLs will work seemlessly in your JAVA application from that point onwards. If you are already a developer and are used to working with these languages and frameworks then the way in which this system works should be reasonably easy to comprehend. In addition, if you are reading this article then perhaps you may already have several use cases in mind for this solution – for example you may have some previously developed code bases written in Microsoft .NET and you think that you can save a lot of development time if you could re-use that code within a JAVA application, rather than having to completely re-write them in JAVA, or perhaps you have two systems, each in one of those languages and you want to make them operate together. However, you may also be new to web development but interested to learn about JavOnet and how you can work with both languages in one application. Or you may have some other use case ideas but are not sure how well they would work. If any of those fit your scenario, then the JavOnet labs are the best place to start – JavOnet have created and published a test or lab environment where you can test out your NET code and really see how it can be translated and used in a JAVA application. Head over to lab.javonet.com and get stuck in with some testing of the JavOnet application platform. When you consider the flexibility and saving on development time that JavOnet will bring, the pricing is very reasonable and comes in several packages depending on your requirements and the way you intend to use JavOnet. Whats great is that you can download a no obligation 30 day trial of JavOnet so you can really get a feel for how it will work in your environment and if it will perform exactly is you require it to, before purchasing.